Beloved wife of the late Michael “Jerry” Brennan. Devoted mother of Michael J. (Janet), Dennis (Mary), Cathy (Jim) Walker, the late Timothy (Maureen), and Daniel (Bridget) Brennan. Proud grandmother of Michael D., Matthew, Mitchell, Ryan, Lauren, Michael P., Brendan, Emma, and Maddie. Loving sister of Michael (Kathleen) Brown, Thomas (Christine) Brown, Beatrice (late Patrick) O’Grady, and the late Margaret (Tom) Haran, the late Anthony Brown and the late John Brown. 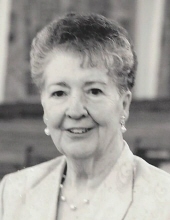 Visitation Wednesday, 9:00 a.m. until time of Mass of the Resurrection 11:00 a.m. at Holy Family Villa, 12220 S. Will-Cook Road, Palos Park, IL. In lieu of flowers, contributions may be made to Holy Family Villa. "Email Address" would like to share the life celebration of Josephine Brennan. Click on the "link" to go to share a favorite memory or leave a condolence message for the family.